How and why did Vladimir Ilyich Ulyanov, better known as Lenin, became a mummy? 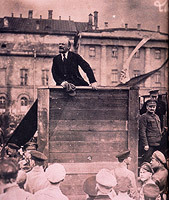 After the 1924 death of the Bolshevik Revolution's leader, Stalin and other Soviet officials decided to preserve Lenin's body for public display in a mausoleum in Red Square. 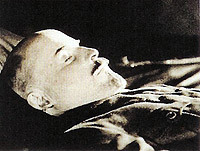 A team of scientists, biochemists and forensic pathologists, working in a laboratory beneath the mausoleum, developed a means to restore Lenin's temporarily embalmed corpse, which had begun to rot two months after his death, and a system of periodic chemical treatments to permanently preserve the body. FOREVER LENIN chronicles this story through archival footage, a wry voice-over commentary, and interviews with Ilya Zbarsky (son of the mausoleum's original director, Boris Zbarsky), the contemporary director of Lenin's Tomb, Vladislav Kozeltsev, and Soviet historian Alex Gusev. The adventures of Lenin's mummy and the laboratory scientists are shown to reflect the tumultuous history of the Soviet Union, including the ideological development of the cult of Leninism, Stalin's bloody purges in the Thirties, the wartime transfer of Lenin's body to Siberia, the display of Stalin's body in Lenin's Tomb until 1961, and the continuing use of Lenin's Tomb as a political podium. Today, after severe budget cuts, Lenin's embalmers support the upkeep of the mausoleum by offering their skills to the former communist nation's nouveaux riches and the Russian Mafia. Perhaps the most down-to-earth comments in FOREVER LENIN are those from a surprisingly sage Moscow gravedigger, nonplussed by the use of a corpse as the shrine for a political cult, who concludes simply that "dead people should be buried." A behind-the-scenes history of the Soviet Union's 10-year long war in Afghanistan.